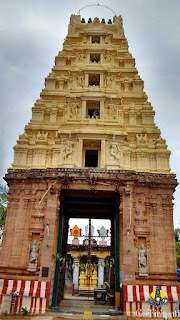 The Venugopala Swamy temple is an ancient temple and exists from the very beginning of Bobbili. The present form of the temple was built by the King Bobbili, Chinna Ranga Rao of the Bobbili dynasty. He built the Venugopala Swamy temple close to the royal palace and is the famous temple in Bobbili. The Temple tower(Raja Gopuram) at the entrance was built in 1851 AD by Swetha Chalapati Ranga Rao. Mantaps inside the temple was built by the King Krishna Das Ranga Rao in 1825 AD. The Vasanth Mantap stands separately in the waters of Narayana Pushkarini(Temple Tank). Every year at the beginning of spring, the Utsava deities will be brought to this Pushkarini for Teppostsavam celebrations. Lord Venugopala with His Consorts Rukmini and Satyabhama will go on a ride in the boat (Teppa). After the celebrations for a day, the Idol will be kept for a day in Dola Yatra Mantap which is located on the banks of this Pushkarini and then carried to the main temple.